This is Home, an award winning film, takes an intimate look at four Syrian families tring to resettle in Baltimore and find their footing. Join One Journey in celebrating women refugee entrepreneurs. On International Women’s Day, March 8th, join us as we celebrate the success, tenacity and resilience of women refugee entrepreneurs. 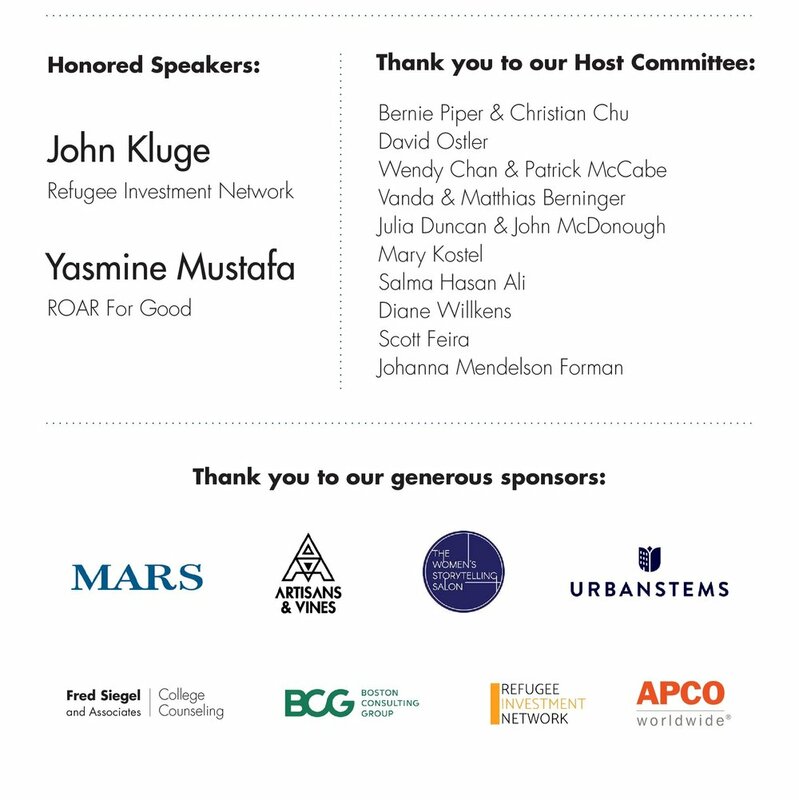 The evening event will feature cuisine by refugee chefs with Foodhini, coffee by Sudanese Refugees, and more inspiring stories from incredible entrepreneurs. This is a formal cocktail event. Program includes: Entrepreneur introduction, founder engagement, dancing and a live fundraiser in support of the 2019 One Journey Festival. Cocktails and hors d’oeuvres will be served. Please join us for the our last of our three-part film series about the global refugee crisis —its tragic scale and impact. We are screening 2 short documentaries showing the difficulties of displacement caused from the Syrian Refugee Crisis. 4.1 Miles is an Oscar-nominated documentary that follows a day in the life of Kyriakos Papadopoulos, a captain in the Greek Coast Guard who is caught in the middle of the biggest refugee crisis since WWII. Follow his journey on how he and his crew are working to save thousands of refugees from drowning in the Aegean Sea. Our second film From Damascus to Chicago shows the life of two young Syrian siblings who were resettled in Chicago. The documentary follows their family's experiences in navigating a new city and country. Our screening will be complemented by a panel of experts. Given Charlottesville's large refugee population, our panelists will be discussing not only the challenges that refugees face, but the contributions that they make to the places they settle. Panelists will share their stories from their experiences to create a world where refugees and other displaced people are welcomed, valued, and supported so they and their host communities can thrive together. 6:50-7:30 - Panel discussion moderated by Christine Mahoney. 7:30-8:00 - Attendees will be able to walk around to visit with tables set up on the perimeter of the Great Hall featuring different refugee organizations at UVA and throughout Charlottesville. Attendees will be able to learn more about what these groups do and how they might be able to get involved. Join us for our Global Holiday Market featuring refugee entrepreneurs and organizations supporting refugees. Enjoy a wide selection of holiday gifts, music, refreshments and more. Join the One Journey Festival for our Global holiday Market featuring refugee entrepreneurs and organizations supporting refugees. Enjoy a wide selection of holiday gifts, music, refreshments and more. The One Journey movement strives to create a world where refugees and other displaced people are welcomed, valued and supported to they and their host communities can thrive together. Jewelry, Handcrafts, Jams & Preserves, Baked Good, Coffee, Clothing, Accessories, Gifts and more! Pedestrian entrance at Wisconsin Ave NW and Lych Gate Road NW. Parking is available at the National Cathedral Parking Garage. You are cordially invited to join One Journey for an evening to celebrate human stories of hope and the innovation of organizations helping refugees worldwide. Please join the One Journey Festival for a free screening of PBS POV’s Voices of the Sea. The film will be followed by a panel discussion on the global refugee crisis and a short Q&A session. Our panelists will tell their stories and navigate the dizzying complexities of the refugee crisis. Revealing stark realities for the poorest of rural Cubans with unique access and empathy, Voices of the Sea is the story of a 30-something mother of four longing for a better life. The tension between wife and aging husband—one desperate to leave, the other content to stay—builds into a high stakes family drama after her brother and the couple’s neighbors escape. This benefit event is a One Journey Festival collaboration with Marymount University, NOVA Friends of Refugees, CAVA, and POV, the award-winning independent non-fiction film series on PBS. This journey has become a movement. And on June 2nd, the movement will find its heart and voice in Washington, D.C. at The One Journey Festival, the first of what promises to be an annual celebration of unity, resilience, and accomplishment. We are sending the message that refugees are vital to our society. We are breaking the status quo by putting the refugees on stage and letting them showcase their unique talents. Join us. Marymount University will present Border (Untitled), an exhibition on the state of culture, art, and politics surrounding immigration and refugees. It will be held at Marymount’s two art galleries, with two free receptions scheduled: from 6 to 8 p.m. on Friday, May 18 at Cody Gallery at the Ballston Center; and from 6 to 8 p.m. on Wednesday, May 30 at the Barry Gallery on the school’s main campus. The dual exhibit runs through July 28. The Marymount show is being held in conjunction with the all-day One JourneyFestival on June 2 at the Washington National Cathedral. Marymount is a sponsor of the festival that aims to connect people through the shared language of human creativity. What do wine and refugees have to do with each other you might ask? A lot more than you think! On the evening of Thursday, April 5th you are invited to join a wine journey that spans the globe. We will travel from the Beqaa Valley in Lebanon, to the Pelopennese in Greece, and then all the way to the Willamette Valley, Oregon. This journey will be a fun one, focused on exposing you to wine cultures you may not be familiar with, but in addition will highlight the realities of what is happening to millions of people in these parts of the world, as our globe continues to struggle with the weight of 64 million displaced people and refugees. The event will end on a celebratory note, focusing on the story of someone who had to flee his homeland, made a home in the U.S. established businesses and benefited greatly from living here. He has decided to take inspiration from his family, and wanted to give back to the country that gave him so much, so he established an incredible winery! Domaine De Tourelles- One of the oldest established wineries in Lebanon, but one doing some of the most exciting things with grapes and land that dates back to the Roman times! This winery is based in the Beqaa Valley, also close to the epicenter of the Syrian refugee crisis in Lebanon. Kotrotsos Winery- A winery established by an oenologist/chemist who had worked for over 15 years in other wineries, Yiannis Kotrotsos decided to make his own wine! The Kotrotsos winery focuses on both native and foreign grape varieties for their wines, wishing to showcase the best that Greece has to offer. We will taste one of the more interesting native Greek varieties! Maysara Momtazi Vineyards- Established in the McMinville AVA (American Viticultural Area) of the Willamette Valley in Oregon, this incredible biodynamic and organic winery focuses their efforts on varietals that match the unique climatic conditions of their beautiful Momtazi Vineyard site, creating amazing and delicious wines. The proceeds from your ticket sales will go to help fund the 1 Journey Festival on June 2nd. The festival will connect participants through the shared languages of humanity: art, fashion, food, music & dance from the countries that today’s refugees originally called home. Celebrities will perform with refugee chefs, musicians, and fashion designers. Our key message is that refugees are vital to our society. Over the past few months we have been working hard to build One Journey that is changing the narrative of refugees in the US. To do this we have organized many past events and have our biggest fundraiser on March 23 that will be about celebrating refugee entrepreneurship!Too often we only hear the negative stories and portrayal of refugees and we are here to change that. Join the One Journey team in this effort by coming to our cocktail fundraiser that showcases this entrepreneurship through art, food and storytelling. The food will be made by refugee chefs (Foodhini), coffee by Sudanese refugees, art displayed by refugees living in Greece and inspiring stories will be shared by a variety of speakers including Her Excellency Ambassador of Jordan, Ahmad Ashkar Founder of Falafel Inc (DC Restaurant of the Year) and Hult Prize Foundation and of course the refugees themselves. As many of you know we are working on building a grassroots movement of compassion and love for refugees through the One Journey Festival. On June 2, 2018, One Journey Festival, the first of what promises to be an annual celebration of unity, resilience and accomplishments of refugees, will take place on the grounds of the Washington National Cathedral. We expect over 3,000+ people to attend this festival and it is not an event to be missed. Please see attached a one-pager overview of the event. Our team would like to invite you to join forces with us in building this volunteer-powered, grassroots movement. Ultimately, we would like to mobilize festival participants to take action and support your incredible efforts to help refugees locally and globally. We are hosting two information sessions next week to share with you the goals of One Journey Festival, our programming, and both digital and traditional ways to get involved. Many opportunities are relevant to US and internationally-based organizations alike. We encourage you to attend one of the two information sessions to learn more about opportunities to collaborate. 65.6 million men, women, and children are displaced due to spiraling crises around the world. This film screening event will explore the hardships faced by 99% of those refugees fighting to survive in resettlement camps with little hope of ever returning home. The award-winning documentary, Salam Neighbor, follows two filmmakers who fully embed themselves in a Syrian refugee camp to chronicle the lives of their displaced neighbors and provide an intimate look at the world's most dire humanitarian crisis. This free 3-part film screening series is being held to raise awareness about the June 2nd, 2018 One Journey Festival, an all-day celebration held at the National Cathedral to celebrate refugee talents, stories, and accomplishments through food, fashion and music. The festival is a partnership of the Washington National Cathedral, NOVA Friends of Refugees, and Refugees International. Want to support our cause? You can do so here. This is the second of a three-part film series about the global refugee crisis —its tragic scale and impact, what happens to the 99% of refugees who have no permanent solution, and the challenges newcomers face when they arrive in the United States. Of the millions of refugees displaced around the world, just 1% will be officially resettled in a new home country. This second film screening event will explore the challenges and opportunities involved in adapting to a foreign community, featuring two short films and a panel discussion. The first film, 4.1 Miles, follows a Hellenic Coast Guard captain tasked with saving thousands of migrants crossing the Aegean Sea. The second, Fold, Embrace, Expand: From Damascus to Chicago, features a dance studio in Chicago working with young Syrians who have recently resettled in the city. The panel will be moderated by Anne Richards, who served as Assistant Secretary of State for Population, Refugees and Migration in the Obama Administration. Panelists will include Dr. Tsehaye Teferra (Founder and President of the Ethiopian Community Development Council) Sandra Vu Le (Chief Confidence Builder of Your Cultural Edge), and more.